The headlines in 2018 were filled with news of major food-related outbreaks and Class I recalls. Many industry professionals have said it's only a matter of time until every company is affected by a major outbreak, recall or withdrawal. 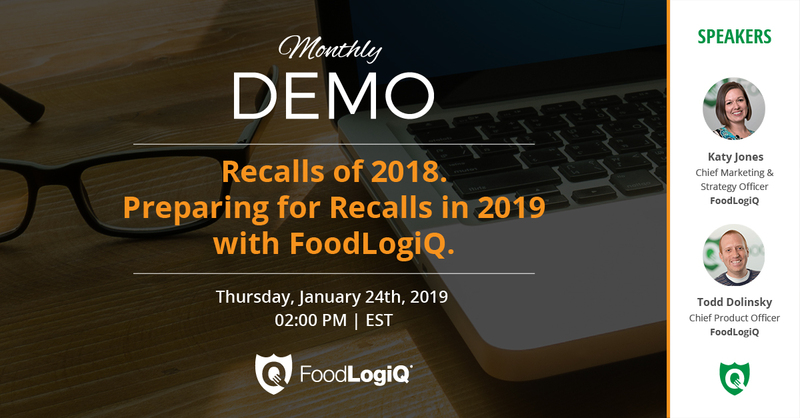 Make sure your organization is prepared for recalls in 2019 with FoodLogiQ. FoodLogiQ's Recall + Response was purpose-built to streamline the recall and withdrawal process for the food industry. Step away from error-prone spreadsheets and frantic phone calls with a templated, customized process - one that's automated with the push of a button.